Mrs. Frankly and I confess to a bad habit. We sometimes watch television programs that highlight the maladies of others. Why? We joke to one another that it makes us feel more normal about our own pathologies. More recently we've taken to watching Hoarders. The folks on Hoarders aren't the out-of-control "spitcom" crowd that pulls each others' hair and accuses one another of dubious paternity. Actually, they seem like the people next door - completely unremarkable men and women that have a hidden problem. They could be your son's teacher, the retired guy that sits next to you at church or the lady handing you your sack of burgers at the drive-through. Now, Tracy and I have our own issues with "piles." We aren't as quick to toss stuff as some. Horizontal spaces attract items at the Weller home; the height of the pile seems to be directly proportional to the the surface size. Nevertheless, we've decided - and correctly so, I think - that we are not hoarders. 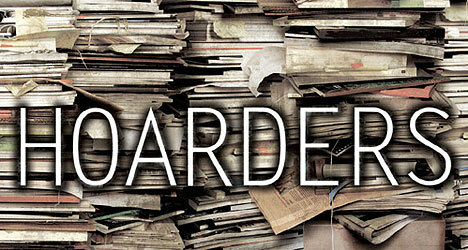 Messy maybe, but not hoarders. We have no compulsion that keeps us from throwing things away. I often do so in the extreme. We are willing to give items away when the situation warrants. And though my kids will tell you that I have a "flashlight fetish" they can confirm that I give away just as many as I have kept. We even had a huge garage sale this year - something a hoarder could never countenance. We discussed all this a few nights ago as we watched an episode about a woman who was struggling to clear out a space so her wheelchair bound son could come live with her when he was discharged from the hospital. She was wrestling with a foundational truth - the same truth that enables most to escape the hoarder's snare: people are more important that possessions. If you watch Hoarders, though, time and again you find sufferers of the disease battling to choose their children over their trash. Viewers have seen, quite literally, grown men and women choosing to hang onto bags of refuse and filth even though it means loosing the people they love. As we watched the program unfold the other night I contemplated this sad reality. I stepped away from the television to go to the restroom and this thought traveled with me: "Who chooses filth over family?" As I caught my reflection in the bathroom mirror the answer was painfully swift - as the words of the Holy Spirit often are. "You do, Frank. Every time you choose sin over me." The unwillingness to discard sin is nothing short of spiritual hoarding. It is my failure to recognize that God demands holiness. And every time I choose to cling to my sin . . . or hide my sin . . . or nurture my sin . . . I reject God. King David wrote, "Who may ascend the hill of the Lord? Who may stand in his holy place? He who has clean hands and a pure heart . . ."
I guess its time for a little house cleaning.